De L'Ogenblik is located in the Galerie des Princes, just off the elegant and beautiful Galeries Royales St-Hubert. It has a split-level dining room, with brass and wooden fittings and floors scattered with sand. 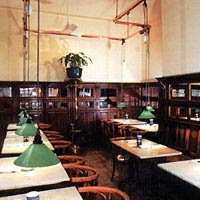 Lights with green lampshades hang over each table and their height can be adjusted via a counterweight system to each diner's satisfaction. The food tends to seafood and game, with few vegetarian options. One of our dining party can only eat chicken or vegetarian, and he found his options quite limited. I opted for the turbot en papillote with garlic butter and vegetables. The price was higher than I would normally pay for lunch (by a factor of 2 or 3) but given that this was a business lunch, price wasn't a concern. When my turbot arrived, the waiter cut open the tinfoil packet for me, releasing the most wonderful garlic aroma. The turbot fillet was resting on some tomatoes and courgettes along with some baby potatoes which had cooked in the juices and the garlic butter. You're obviously paying for the atmosphere and tradition of L'Ogenblik when you eat there. While the food is good, it's not great, but the convivial air of the restaurant undoubtedly makes it a favourite of the regular customers.